School is back in session which means sports and activities are in full swing and dinner is a challenge. 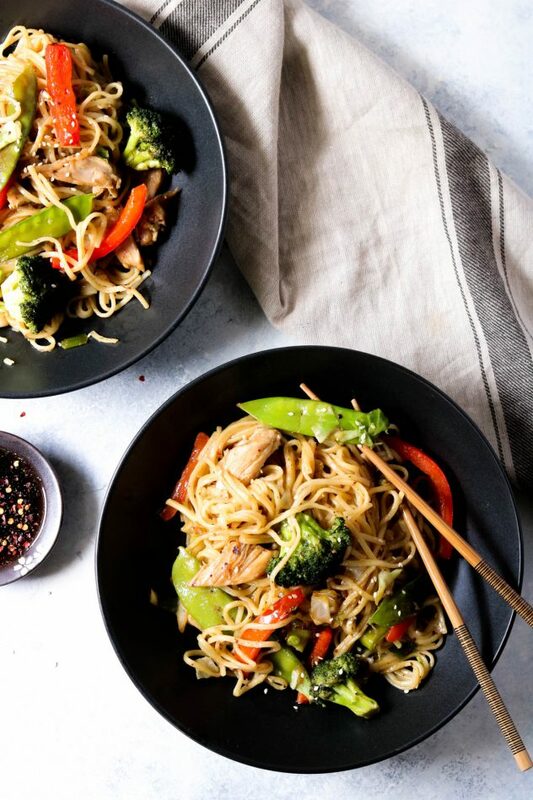 Try this chicken lo mein dinner option that will feed a hungry crowd and be cheaper on your wallet than ordering take-out. I don’t know about you, but when our schedules get hectic, the first thing that goes out the window is cooking at home. It’s just so much easier to eat out, drive-thru, or have food delivered. Who feels me?? But, we’ve been working on being super mindful about what we’re spending our money on. When I sat down to look at our monthly budget, I was shocked by the amount of money we spend weekly on eating out. Crazy! Plus, there’s just something about cooking a meal at home and having everyone gather around the table to enjoy it. Call me old school, but I’m all in favor of less consumerism and more authentic time together. 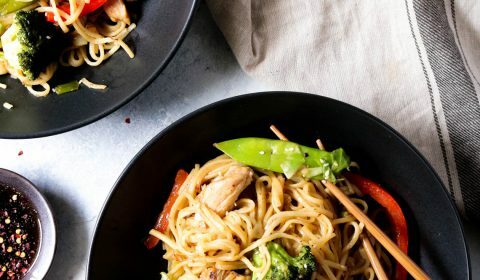 Now, whether or not eating out less is on your family’s agenda, this chicken lo mein is super easy (notice a trend here lately), will feed a large crowd (hello teenage boys), and tastes just as good as any take-out! 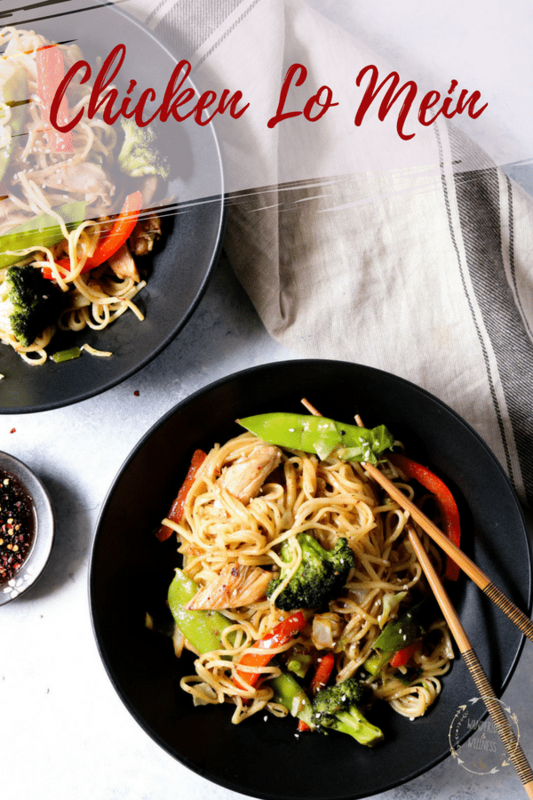 If you don’t have a large family, this recipe would be perfect for meal prepping for the week. It easily contains 6-8 servings, so if it’s just you or a few, that’s leftover dinner and possibly some lunches for the week. I don’t meal prep much, mostly because our family is so large I’m doing good just to keep us all fed every week! But if I did, this would definitely be a go-to recipe. 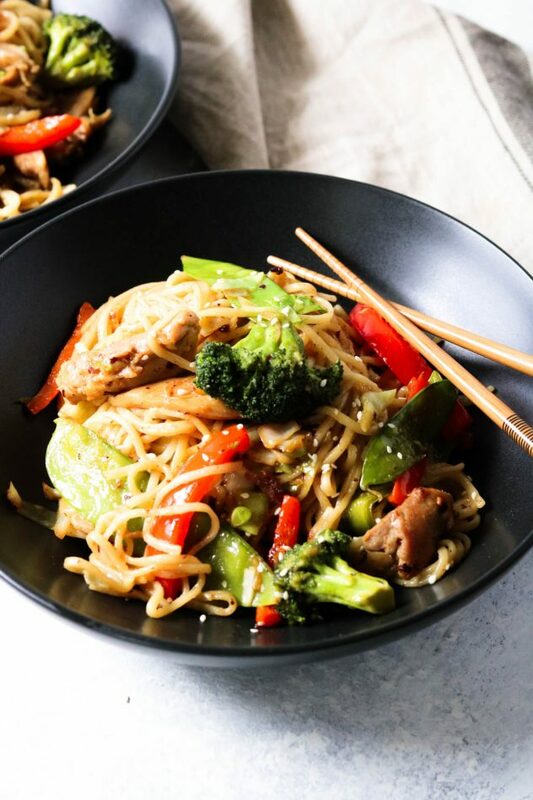 This chicken lo mein recipe includes a variety of fresh vegetables, but feel free to make it your own and add whatever fresh veggies your family will enjoy. I find that if I embed vegetables into dishes like this, my kids tend to eat them more vs. on their own. Are my teens the only anti-vegetable kids out there?? Somedays it sure feels like it. Regardless, I hope your family enjoys this chicken lo mein as much as mine did. The pan was empty in minutes! Boil the lo mein noodles according to package directions, drain and set aside. Before starting the chicken, while the noodles are cooking, prepare your vegetables. Cut the broccoli florets free from the stems. Cut the red peppers into thin, julienned strips. Thinly shred the cabbage, and dice the green onion from the top down to just before the root. Set all vegetables aside until ready to use. In a small saucepan, combine 6 tablespoons of liquid aminos, honey, sesame oil, and red pepper flakes. Heat over medium-low heat, stirring occasionally. In a large skillet, (high-walled preferable), melt the coconut oil over medium heat. Add the garlic, ginger, salt, and pepper. Stir to combine with the oil, then add the chicken thighs and cook until done, turning occasionally. Remove chicken from skillet, transferring to a plate, and set aside. Add 1 tbsp. of the liquid aminos to the skillet. Add in the red pepper, broccoli, and snow peas. Cook until softened. Then add in the cabbage and green onion. Cook until softened. Add the noodles and the chicken to the vegetables in the skillet. 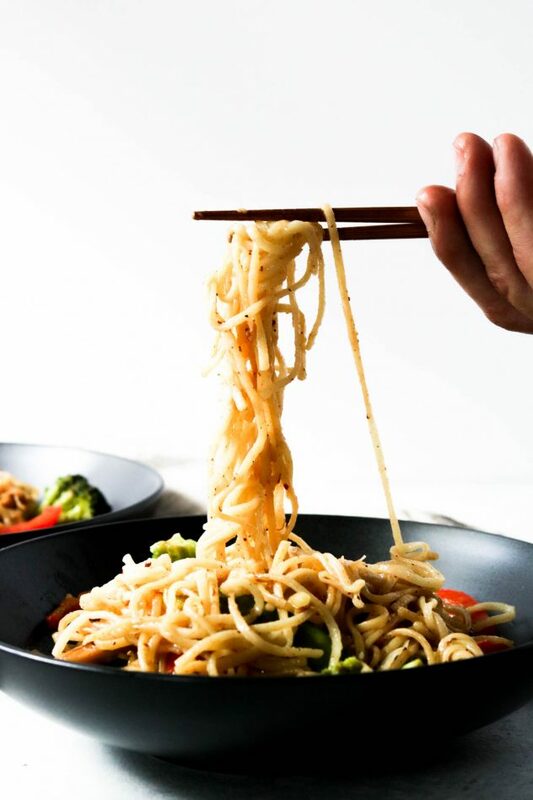 If the noodles are sticky, add a little sesame oil to break them up before adding to the skillet. Stir to combine all of the ingredients. Just before serving, pour the sauce over the noodle mixture, stirring to coat everything well. Top with sesame seeds and serve. Jennifer Shreckengost/Wanderlust and Wellness is a participant of the Amazon Services LLC Associates Program, an affiliate advertising program designed to provide a means for sites to earn advertising fees by advertising and linking to Amazon.com.